It is with great pleasure that I announce Vicki from CardaTart as our Ray of Sunshine this week with this gorgeous creation. Make sure your visit her blog and let her know how much you love it. 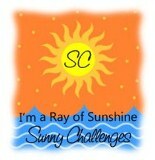 Here is our Ray of Sunshine badge Vicki, feel free to display it on your blog. Don't forget to check in tomorrow for our new challenge. 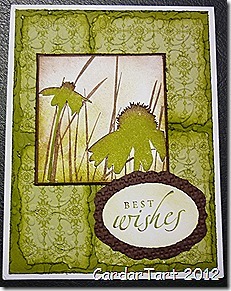 We look forward every week to seeing your gorgeous creations. We would love it if you could spread the word about our challenges to your stamping friends, because if we get 10 entries we can choose two Rays of Sunshine and we would love to be able to do that next week.